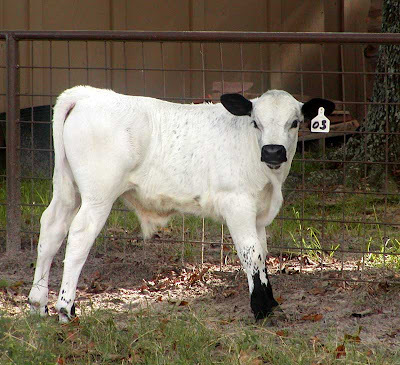 What follows is an article from 1903 reporting on the status of the "wild white cattle" of the United Kingdom. It should be noted that neither herd, nor the breed in general, is referred to as being either horned or polled. 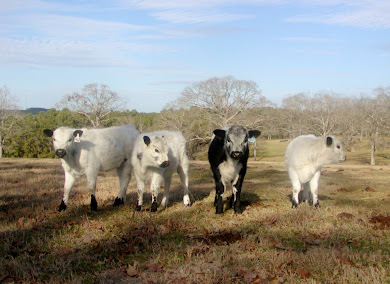 It is however well documented that both horned and polled 'wild white cattle' were in these old herds. 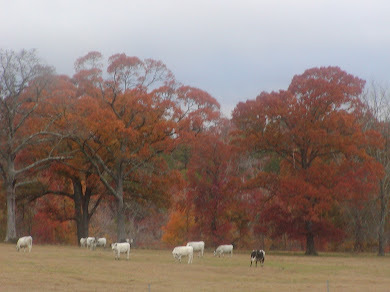 In 1918 the Park Cattle Society was formed, and a registry inclusive of both horned and polled Park Cattle was established and maintained until 1946. And of course the quite 'wild' notion that the wild white cattle were descended from the Urus, a speculative fiction perpetuated by the Chillingham's for hundreds of years, was very much still alive and well -- but clearly found somewhat of an amusing notion. 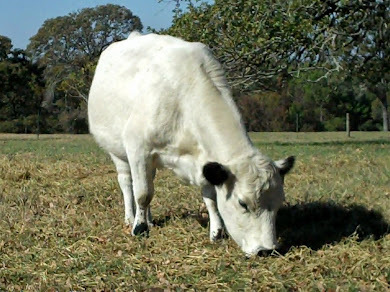 "In view of the fact that only a few specimens of the original wild white cattle which at one time roamed the forest solitudes of these countries are now left in the United Kingdom, it is regrettable to learn that the herd of those animal's which has been in existence for many years past at Chartley is threatened, with extinction. Some years ago, owing to an outbreak of rinderpest, the herd of these wild white cattle kept by the Duke of Hamilton at Cadzow (see 1835 print below) was reduced to less than a dozen, but, thanks to the adoption of special measures to facilitate breeding operations among them, tho stock again multiplied steadily until the herd once, more reached its original dimensions. The rapidity with which the Cadzow herd recovered itself in that crisis is rendered specially interesting at the present juncture because of the corresponding position into which the herd at Chartley Castle has fallen. Some time ago a number of the animals in this herd were found suffering from a destructive disease, and before the progress of the malady could be arrested a good many fatal cases had occurred. 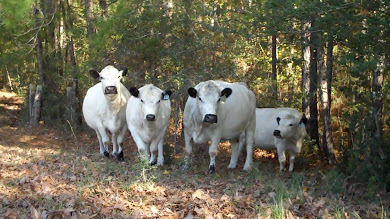 According to the latest reports the total number of wild cattle at Chartley at the present time falls short of a dozen; it is therefore to be hoped that, as in the case of the Cadzow Park cattle, such steps will be taken as will prevent the extinction of the herd, and the consequent disappearance of one of the most interesting links between the present and the past of stock-breeding in these countries. The origin of these and the other wild cattle left in England and Scotland has been much speculated upon, but no very definite conclusion has ever been reached. They are small in size, and there is little to encourage the belief that they are the descendants of the great Urus that was once plentiful enough in this part of the world. But, whatever their lineage, it would be unfortunate if they were allowed to die out, and with them so many interesting associations. 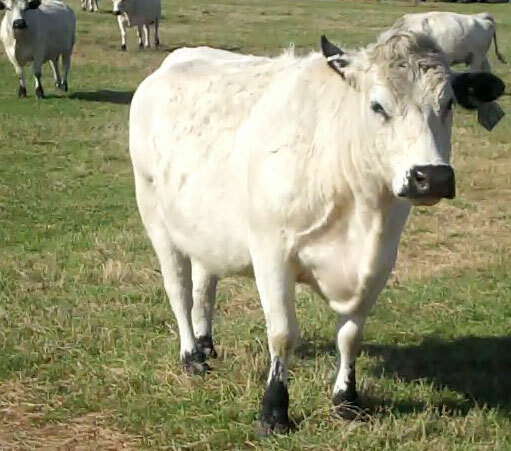 Apropos of these wild white cattle, it is interesting to learn that in browsing on what may be described as their native wilds, they always keep close together, never scattering or straggling, a peculiarity which does not belong to any domesticated cattle. 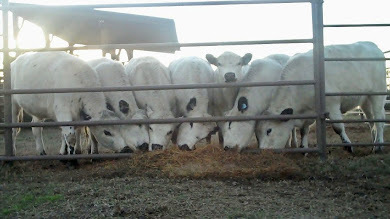 The wild cows are also remarkable for their systematic manner of feeding. At different periods of the year their tactics are different, but by those acquainted with their habits they are always found about the same part of the forest at the same hour of the day. In the height of summer they always bivouac for the night towards the northern extremity of their confines; from this point they start in the morning and browse to tho southern extremity, and return at sunset to their old rendezvous, always feeding close together." 1835 Elegant engraved image titled, "The White Uru or Hamilton (Cadzow) Breed of Wild Cattle." 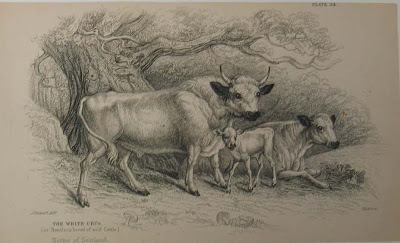 NOTE: In this 1835 image you see both a horned example of the Park cattle breed, along with a Polled example of the breed; as well, the young calf is what we consider to be under-marked today. Growth Pattern of Bulls - When are they 'Fully Matured'? At what age do they express their muscling potential? I always enjoy calls that come from folks interested in learning more about the British White breed. Oftentimes, the questions asked of me leave me pondering the question to myself of how I can better answer those questions next time around. Recently, the question/observation was posed that full muscle expression in bulls wouldn't generally show itself until they were further on the road to maturity. I was hesitant in that regard, as my first thought was that by yearling age the muscling attributes of a bull should be well visible. 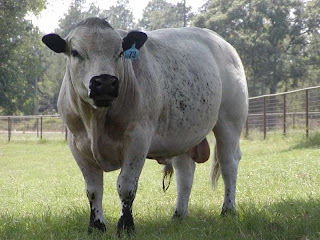 I found myself looking back through photos of various bulls, particularly the ones that I've seen grow to maturity myself or via photographs, which really amounts to just a handful of bulls. After looking through those photos, I came to the conclusion that the muscling potential really ought to be clear by yearling age under optimal nutrition for the frame score of the animal in question. 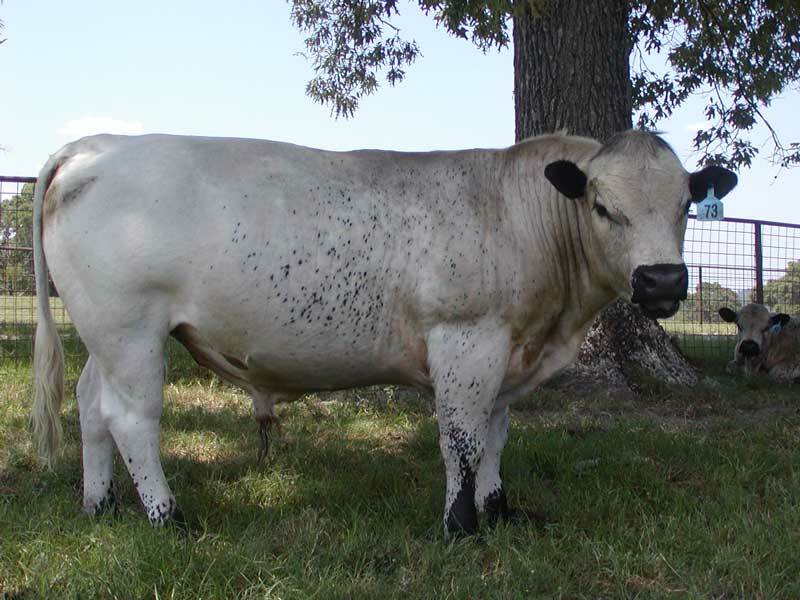 And even during the bull's months as a calf at his dam's side, the muscling potential is apparent. Most often, if the animal is expressing more muscle definition than its peers, it's noticeable; if much less definition than the others, that's fairly noticeable as well. Pictured to the left is an Elvis sired bull calf that did receive his sires muscling in the rump; he grew up to be J.West's Big Mac, and was the most like his sire, Elvis, of any of Elvis' sons to date, including his good-natured disposition. That said, without a doubt as the bull matures that muscle expressed in youth continues to increase tremendously as the years pass -- but the basic structure, the basic muscle expression remains the same. 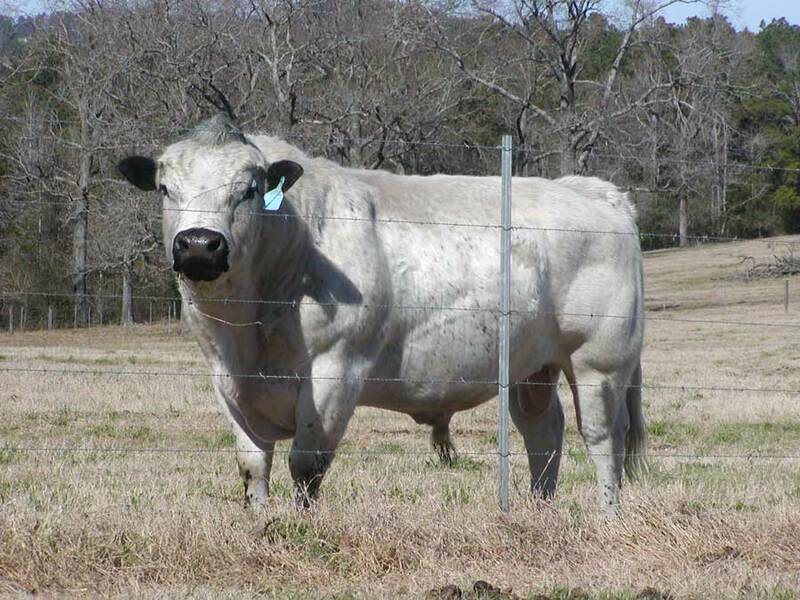 What follows are some photos of my senior herd bull, J.West's Elvis. Unfortunately, I haven't been able to locate calf photos of him, I didn't take as many pictures back then and didn't have the benefit of a digital camera. Nonetheless, from the time he was born, he was quite a distinctively made and handsome youngster; thus the name Elvis that was given him. I've also included the different weights taken on Elvis over the years, which illustrate quite well for me the transformation of my good-natured, short and chunky, handsome bull calf into the mature and hefty Frame Score 2/3 herd bull he is today. Elvis' hip height measure was taken by Gerald Fry when Elvis was just over 48 months of age and he stood 51" over his hook bones. This puts Elvis at somewhere between a Frame Score 2 and Frame Score 3, depending on charting sources. 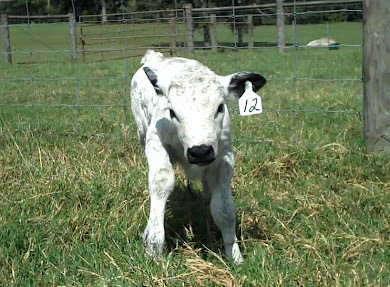 J.West's Elvis was born March 10, 2003, with a recorded birth weight of 76 lbs. using a taped chest measure. It's possible it was lower, as I didn't hold the tape snugly back then as is recommended for the best weight estimate. Elvis was weaned in fall of 2003 with an actual wean weight of 438 lbs on the 28th of November. His dam, Halliburton Adios, a Popeye daughter, weighed 846 lbs on that same day and she was almost exactly 3 years old. Elvis was her second calf. The next weight I can locate on Elvis is from November 12, 2004, and this photo of Elvis' Rump is from November of 2004 -- at 20 months of age. His weight was 856 lbs., practically a doubling in size over the prior 12 months. Unfortunately, I can't locate any other photos of him from this group, it predates my switch to a digital camera. Hopefully, I'll locate the Kodak disc one of these days that the photo came from. My next actual weight on Elvis was Feb. 16, 2005, at 23 months old, and he had reached 980 lbs., a gain of about 40 lbs. a month, and not bad with zero grain concentrates that winter. The photos below were taken in May of 2005 when Elvis was about 26 months old. He was fully expressing his muscling - but still had much, much growing ahead of him. Unfortunately, I don't have another recorded weight on Elvis until May 15, 2008. At 5 years of age he had reached a weight of 1715 lbs. The next weight recorded was on December 18, 2009, at what I'm sure is his peak mature weight of 1785 lbs. He is pictured below at about this same time. And if you compare the photo below and the one above, the muscle expression is very much the same, just extraordinarily increased. The growth of Elvis from a 2 year old to his 6th year can better seen in this March 2009 video of Elvis below. He does seem to have expressed more muscling with age, he is almost twice as heavy, but he has also laid on a lot of fat at this stage, which can add to perceived muscling in most mature bulls. In Elvis's case, there is definitely muscle defining him in every way, with the fat cover adding to his natural gifts, although he has lost that bloom of youth and the sharpness of his muscling - I think he perhaps should have to work a bit harder! Elvis is a 100% grassfed bull, he has high genetic Feed Efficiency, and there's never been a day when he was not well fit.